Strong coherent interactions between colocalized optical and mechanical eigenmodes of various cavity optomechanical systems have been explored intensively toward quantum information processing using both photons and phonons. In contrast to localized modes, propagating mechanical waves are another form of phonons that can be guided and manipulated like photons in engineered phononic structures. Here, we demonstrate sideband-resolved coupling between multiple photonic nanocavities and propagating surface acoustic waves up to 12 GHz. Coherent and strong photon–phonon interaction is manifested with electro-optomechanically induced transparency, absorption, and amplification, and phase-coherent interaction in multiple cavities. Inside an echo chamber, it is shown that a phonon pulse can interact with an embedded nanocavity for multiple times. Our device provides a scalable platform to optomechanically couple phonons and photons for microwave photonics and quantum photonics. F. Marquardt and S. M. Girvin, “Optomechanics,” Physics 2, 40 (2009). S. Mancini, D. Vitali, and P. Tombesi, “Scheme for teleportation of quantum states onto a mechanical resonator,” Phys. Rev. Lett. 90, 137901 (2003). A. H. Safavi-Naeini and O. Painter, “Proposal for an optomechanical traveling wave phonon–photon translator,” New J. Phys. 13, 013017 (2011). K. Børkje, A. Nunnenkamp, and S. M. Girvin, “Proposal for entangling remote micromechanical oscillators via optical measurements,” Phys. Rev. Lett. 107, 123601 (2011). A. H. Safavi-Naeini, T. P. M. Alegre, J. Chan, M. Eichenfield, M. Winger, Q. Lin, J. T. Hill, D. E. Chang, and O. Painter, “Electromagnetically induced transparency and slow light with optomechanics,” Nature 472, 69–73 (2011). J. Chan, T. P. M. Alegre, A. H. Safavi-Naeini, J. T. Hill, A. Krause, S. Groblacher, M. Aspelmeyer, and O. Painter, “Laser cooling of a nanomechanical oscillator into its quantum ground state,” Nature 478, 89–92 (2011). J. D. Teufel, T. Donner, D. Li, J. W. Harlow, M. S. Allman, K. Cicak, A. J. Sirois, J. D. Whittaker, K. W. Lehnert, and R. W. Simmonds, “Sideband cooling of micromechanical motion to the quantum ground state,” Nature 475, 359–363 (2011). D. W. Brooks, T. Botter, S. Schreppler, T. P. Purdy, N. Brahms, and D. M. Stamper-Kurn, “Non-classical light generated by quantum-noise-driven cavity optomechanics,” Nature 488, 476–480 (2012). A. H. Safavi-Naeini, S. Groblacher, J. T. Hill, J. Chan, M. Aspelmeyer, and O. Painter, “Squeezed light from a silicon micromechanical resonator,” Nature 500, 185–189 (2013). A. Yariv and P. Yeh, Optical Waves in Crystals: Propagation and Control of Laser Radiation (Wiley, 2003). A. Korpel, Acousto-optics (Marcel Dekker, 1997). R. M. Shelby, M. D. Levenson, and P. W. Bayer, “Guided acoustic-wave Brillouin scattering,” Phys. Rev. B 31, 5244–5252 (1985). P. St.J. Russell, D. Culverhouse, and F. Farahi, “Theory of forward stimulated Brillouin scattering in dual-mode single-core fibers,” IEEE J. Quantum Electron. 27, 836–842 (1991). M. S. Kang, A. Brenn, and P. St.J. Russell, “All-optical control of gigahertz acoustic resonances by forward stimulated interpolarization scattering in a photonic crystal fiber,” Phys. Rev. Lett. 105, 153901 (2010). B. J. Eggleton, C. G. Poulton, and R. Pant, “Inducing and harnessing stimulated Brillouin scattering in photonic integrated circuits,” Adv. Opt. Photon. 5, 536–587 (2013). H. Shin, W. Qiu, R. Jarecki, J. A. Cox, R. H. Olsson, A. Starbuck, Z. Wang, and P. T. Rakich, “Tailorable stimulated Brillouin scattering in nanoscale silicon waveguides,” Nat. Commun. 4, 1944 (2013). J. C. Beugnot, S. Lebrun, G. Pauliat, H. Maillotte, V. Laude, and T. Sylvestre, “Brillouin light scattering from surface acoustic waves in a subwavelength-diameter optical fibre,” Nat. Commun. 5, 5242 (2014). R. Van Laer, B. Kuyken, D. Van Thourhout, and R. Baets, “Interaction between light and highly confined hypersound in a silicon photonic nanowire,” Nat. Photonics 9, 199–203 (2015). M. Merklein, I. V. Kabakova, T. F. Buttner, D. Y. Choi, B. Luther-Davies, S. J. Madden, and B. J. Eggleton, “Enhancing and inhibiting stimulated Brillouin scattering in photonic integrated circuits,” Nat. Commun. 6, 6396 (2015). M. Tomes and T. Carmon, “Photonic micro-electromechanical systems vibrating at X-band (11-GHz) rates,” Phys. Rev. Lett. 102, 113601 (2009). G. Bahl, M. Tomes, F. Marquardt, and T. Carmon, “Observation of spontaneous Brillouin cooling,” Nat. Phys. 8, 203–207 (2012). G. Bahl, J. Zehnpfennig, M. Tomes, and T. Carmon, “Stimulated optomechanical excitation of surface acoustic waves in a microdevice,” Nat. Commun. 2, 403 (2011). C.-H. Dong, Z. Shen, C.-L. Zou, Y.-L. Zhang, W. Fu, and G.-C. Guo, “Brillouin-scattering-induced transparency and non-reciprocal light storage,” Nat. Commun. 6, 6193 (2015). M. M. de Lima and P. V. Santos, “Modulation of photonic structures by surface acoustic waves,” Rep. Prog. Phys. 68, 1639–1701 (2005). M. M. de Lima, Y. A. Kosevich, P. V. Santos, and A. Cantarero, “Surface acoustic Bloch oscillations, the Wannier–Stark ladder, and Landau–Zener tunneling in a solid,” Phys. Rev. Lett. 104, 165502 (2010). V. Laude, D. Gerard, N. Khelfaoui, C. F. Jerez-Hanckes, S. Benchabane, and A. Khelif, “Subwavelength focusing of surface acoustic waves generated by an annular interdigital transducer,” Appl. Phys. Lett. 92, 094104 (2008). S. Mohammadi, A. A. Eftekhar, W. D. Hunt, and A. Adibi, “High-Q micromechanical resonators in a two-dimensional phononic crystal slab,” Appl. Phys. Lett. 94, 051906 (2009). E. B. Magnusson, B. H. Williams, R. Manenti, M.-S. Nam, A. Nersisyan, M. J. Peterer, A. Ardavan, and P. J. Leek, “Surface acoustic wave devices on bulk ZnO crystals at low temperature,” Appl. Phys. Lett. 106, 063509 (2015). M. V. Gustafsson, T. Aref, A. F. Kockum, M. K. Ekstrom, G. Johansson, and P. Delsing, “Propagating phonons coupled to an artificial atom,” Science 346, 207–211 (2014). J. Bochmann, A. Vainsencher, D. D. Awschalom, and A. N. Cleland, “Nanomechanical coupling between microwave and optical photons,” Nat. Phys. 9, 712–716 (2013). K. Y. Fong, L. R. Fan, L. Jiang, X. Han, and H. X. Tang, “Microwave-assisted coherent and nonlinear control in cavity piezo-optomechanical systems,” Phys. Rev. A 90, 051801(R) (2014). D. A. Fuhrmann, S. M. Thon, H. Kim, D. Bouwmeester, P. M. Petroff, A. Wixforth, and H. J. Krenner, “Dynamic modulation of photonic crystal nanocavities using gigahertz acoustic phonons,” Nat. 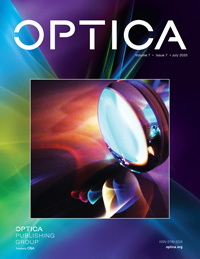 Photonics 5, 605–609 (2011). S. Datta, Surface Acoustic Wave Devices (Prentice-Hall, 1986). C. Campbell, Surface Acoustic Wave Devices and their Signal Processing Applications (Academic, 1989). M. V. Gustafsson, P. V. Santos, G. Johansson, and P. Delsing, “Local probing of propagating acoustic waves in a gigahertz echo chamber,” Nat. Phys. 8, 338–343 (2012). S. A. Tadesse and M. Li, “Sub-optical wavelength acoustic wave modulation of integrated photonic resonators at microwave frequencies,” Nat. Commun. 5, 5402 (2014). Q. Quan and M. Loncar, “Deterministic design of wavelength scale, ultra-high Q photonic crystal nanobeam cavities,” Opt. Express 19, 18529–18542 (2011). A. Ruiz and P. B. Nagy, “Diffraction correction for precision surface acoustic wave velocity measurements,” J. Acoust. Soc. Am. 112, 835–842 (2002). A. Khelif, A. Choujaa, S. Benchabane, B. Djafari-Rouhani, and V. Laude, “Guiding and bending of acoustic waves in highly confined phononic crystal waveguides,” Appl. Phys. Lett. 84, 4400–4402 (2004). A. El Habti, “High-frequency surface acoustic wave devices at very low temperature: application to loss mechanisms evaluation,” J. Acoust. Soc. Am. 100, 272–277 (1996). Fig. 1. (a) 3D illustration of the device configuration, featuring the IDT and the excited SAW propagating in the transverse direction to the nanobeam photonic crystal nanocavity. (b) Optical microscope image of a device. The nanocavity is side-coupled to a waveguide connected with two grating couplers. (c) Scanning electron microscope image of the nanobeam cavity side-coupled to a waveguide (green) and the IDT (yellow). The linewidth of the IDT fingers is 112.5 nm. (d) Transmission spectrum measured from the nanocavity showing the fundamental (at 1529.7 nm) and the first-order (at 1538.3 nm) resonance modes. (e) Zoom-in of the fundamental resonance of the nanocavity, showing a linewidth of 3.88 GHz. (f) Spectrum of de-embedded and normalized reflection coefficient S11 of the SAW IDT. High-order Rayleigh modes from R11 to R16 can be observed as resonance dips. Inset: simulated displacement field of the R14 mode, showing that the displacement is more confined in the top AlN layer. For clarity, the displacement field profile is rescaled and truncated. (g) Zoom-in of the normalized S11 spectrum of the R14 mode plotted in a linear scale, showing a linewidth of 38.9 MHz. Fig. 2. (a) Spectrum of the system transmission coefficient S21 (red line) in a linear scale, measured using optical detection with the nanocavity and electromechanical excitation of the SAW. Rayleigh modes (R4–R10) not visible in the reflection spectrum (gray line) can be detected with high sensitivity by the nanocavity. (b) Zoom-in of the reflection and transmission spectra of the R14 mode [inside the yellow box in panel (a)]. (c) Amplitude (peak value) of the oscillating optical power at the S21 peak of the R14 mode when the laser detuning relative to the cavity resonance is varied. The data (red symbols) are fitted with the theoretical model (blue line) of the cavity optomechanical system in the sideband-resolved regime (see Supplement 1 for details). Fig. 3. (a) Diagram illustrating the three-wave mixing process of the control (ωc), probe (ωp), and SAWs (ΩSAW). The cavity resonance frequency is ω0 with a decay rate of κ. (b) The homodyne measurement scheme used in the experiment. The probe light is derived from the control light when the latter is modulated at frequency of Δp, which is scanned to obtain the transmission spectrum. (VNA, vector network analyzer; PS, power splitter; PD, photodetector; EOM, electro-optic modulator; TGA, tunable gain amplifier; ϕ, phase shifter; BPF, bandpass filter.) (c) Transmission spectrum of the probe light when the SAW is off (gray symbols) and on (red, blue symbols). Cavity absorption is shown as a dip in the light gray region. When the SAW-induced anti-Stokes light is in-phase with the probe, constructive interference leads to transparency and gain as shown by the peak above unity transmission (the light blue region). When the anti-Stokes light is π out-of-phase with the probe, destructive interference enhances cavity absorption (the light gray region), leading to a high extinction of the probe. (d) Gain of the system in the transparency window when the SAW power is increasing (orange, 0.33 μW; olive, 0.66 μW; purple, 1.3 μW; green, 2.6 μW; red, 5.2 μW). (e) Transmitted probe light when the phase shift ϕ is set at 0 (red), π/2 (green), π (blue), and 3π/2 (purple). When the phase is at π/2 and 3π/2, the line shapes imitate those of Fano resonances. (f) The dependence of the system gain on the SAW power. The red symbols are experimental data, whereas the black curve is the theoretical fitting. Fig. 4. (a) Optical image of a device with three nanocavities in the path of SAW propagation. The photonic cavities are end-coupled with the waveguides and the SAW operates at a lower frequency of 1.75 GHz. Overlaid on the image is the calculated amplitude distribution of the diffraction pattern of the SAW. (b) The calculated displacement amplitude along the center line of the SAW beam, showing nonmonotonic variation along the propagation direction. The symbols are the S21 magnitude measured from the three nanocavities. The dashed line is the e−αr/r1/2 asymptote of the far-field amplitude of the wave for comparison, where α is the material loss assumed to be (1.5 mm)−1. (c) |S21| spectra measured from the three nanocavities at distances of 0, 0.5, and 1.5 mm from the IDT. (d) Group delay of the three cavities’ responses to the SAW as a function of their distances from the IDT. The inverse of the slope gives a group velocity of 4.0 km/s. Fig. 5. (a) Optical image of the device. The distance between the IDT and the Bragg reflector is D. (b) |S21| spectra of devices with varying lengths D of the phononic cavities (red, green, blue lines), compared with a device without the Bragg reflector (black line). The spectra show peaks corresponding to the resonances of the phononic cavity with decreasing peak spacing (or free spectral range) when the cavity length is increased. (c) Time-domain echo measurement of an acoustic pulse traveling inside phononic cavities of varying lengths D. The light-colored traces are 20 times magnifications of the dark-colored traces. The acoustic pulse is excited by a 40 ns long burst of microwaves at 1.75 GHz (orange). Up to four echoes of the pulse can be detected by the nanocavity. (d) The arrival time and (e) the amplitude of the detected echoes as a function of the apparent travel distance of the acoustic pulse. The red dashed lines are guides for the eyes assuming (d) a constant group velocity of 4.0 km/s and (e) exponential loss. The data deviate from the linear propagation due to extra delay (∼0.1 μs) and loss (∼8 dB) at the Bragg reflectors of finite length.